I am so happy that someone decided to order this bespoke ink from Diamine and that Diamine seems to have decided to include this in their regulars (that according to a discussion at FPN) and sell it through their website. (As usual: click on pics to see them in a bigger size). A bespoke colour that seems to be on its way to be one of Diamine’s regular inks – thanks to the person who ordered this ink and to Diamine that provides this to its other customers. Pens used : Stipula Ventidue (22) with a 1.1 mm italic & Yard-O-Led Viceroy Victorian with a broad nib. Paper: Ordinary 80 g copy paper. Colour: This is a very special colour – it is somewhere on the verge between violet and purple. It is muted, but not dull – more like a gleaming, dark amethyst. It shades in a rich, beautiful way – from medium pale to very dark amethyst violet-purple. This shading makes the amethyst perfect for use in a broader nib and/or italic/stub. The colour is original and I like it very much. Its non bright colour makes it suitable for most purposes, maybe with the exception of more conservative office use. 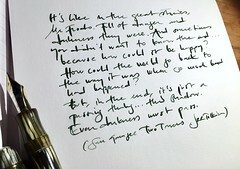 In all: an original and beautiful ink that it is a pleasure to write with. Compared with Diamine Damson, Diamine Imperial Purple and Pilot Violet. Flow & lubrication: The flow is very good – I’ve not experienced any clogging problems. It is nor wet or dry. The lubrication is good, but not extra ordinary. It doesn’t add smoothness to a toothy nib, but it doesn’t make a smooth nib more toothy. One could say that its lubrication is neutral. Feathering, bleedthrough and water resistance: The feathering and the bleed through is minor on most fountain pen friendly papers. On this copy paper it is slightly more than minor, but it is not a problem if you don’t deep study it. The amethyst isn’t a water resistant ink, but I’ve done two water tests. Above I did a minor water test by stroking the alphabet with a dampe/fairly wet towel. 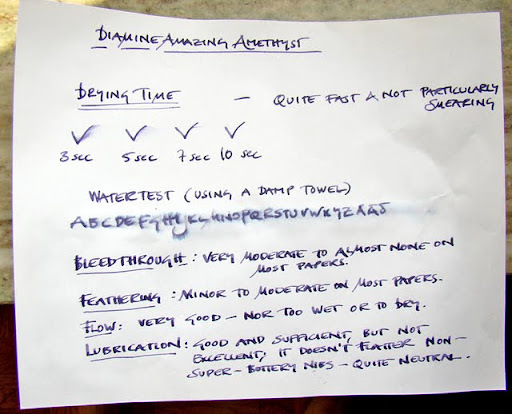 Below is a water test where the paper was put under a running tap for about 1 1/2 minute and then patted semi-dry with household paper and then left to dry. 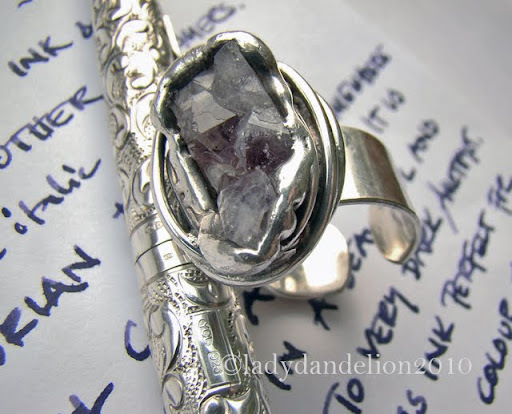 The amazing amethyst seems to be even less water resistant than its fellows, but I think it would handle a spilled glass of water quite well – if patted dry fast. In all this is a very beautiful and pleasant ink that I really like to use – especially in broader nibs that do it justice. In a narrow nib its exquisite shading doesn’t show properly, but it is nevertheless nice in a narrower nib too. One of my current favourites. Another thing I like is that Diamine sells this ink in small, cheap 30 ml bottles – easy to try – and one can put it in a glass bottle if one doesn’t like the plastic bottle it comes in – and use the plastic while travelling. You can read another great review of this ink at FPN – here . 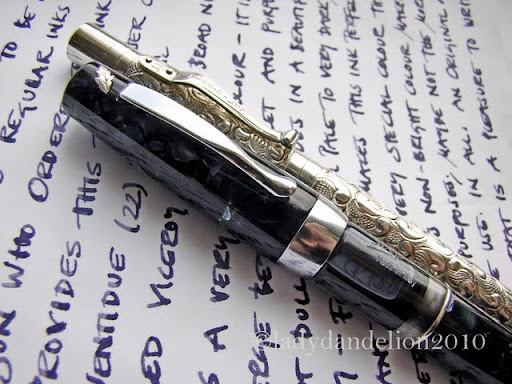 This entry was posted in diamine, fountain pens, inks, photo, pilot, reviews, stipula, Uncategorized, writing, yard o led and tagged amethyst, diamine, fountain pens, ink, pens, photo, pilot, review, reviews, stipula, writing, yard o led. Bookmark the permalink. Very nice review and pictures. The silver ring was very appropriate. What a marvellous ink and what a thorough review! The photos are also delightful. A well-looked after blog and visually pleasing too. Another great review. I love blue inks of all hues. This is an especially lovely one. Nice review. Appreciate all the effort you put into your reviews.